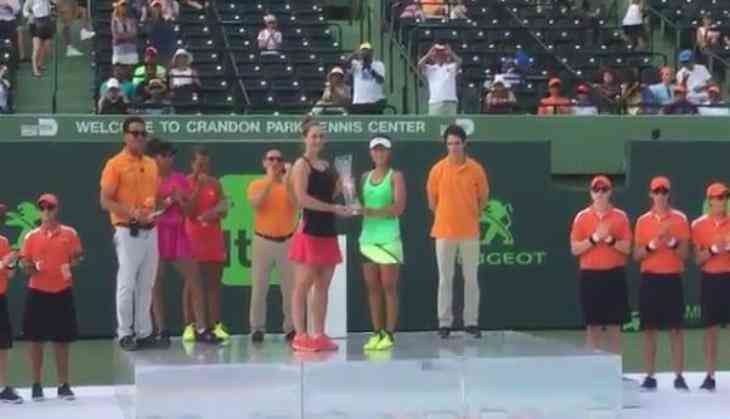 The Indo-Czech pair of Sania Mirza and Barbora Strycova suffered a straight-sets defeat against Canadian-Chinese pair of Gabriela Dabrowski and Xu Yifan in the Women's Doubles final of Miami Open on Sunday. The third seeded pair was defeated by the unseeded Canadian-Chinese pair 6-4, 6-3. Mirza and Strycova were playing in their fifth finals together, having won in Cincinnati and Tokyo in 2016. Mirza leads the four finalists with 41 WTA doubles titles. Dabrowski and Xu became the first women from their respective countries to win in Miami. By virtue of reaching the finals, the duo also ensured that at least one unseeded team contested the Miami championship for the fifth time in 10 years. Meanwhile, it was a fourth doubles title for the winners.